Have you ever wondered if the worst were to happen and you needed your business information readily available in order to keeping your business going? Are you a business owner who knows everything about your business and you are the only one? 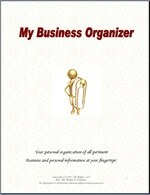 The purpose of My Business Organizer is to have a detailed record of all the aspects of your business and how you run your business in case of an emergency, disaster or even if you are planning on selling your business. All the details of your business in one location for easy reference. Whether you are a seasoned business owner or just starting out – this is one product that you and your business needs! Who do you marketing your services/products to? Where do you advertise your business – Internet? Where do you advertise your business through print?